This would not be the first time; in 1933 President Roosevelt issued an Executive Order – calling in gold. President Gerald Ford repealed the Executive Order December 31, 1974, with Executive Order 11825. This was necessary because on the same day Congress restored Americans’ right to own gold. In 1977 Congress removed the president’s authority to regulate gold transactions during a period of national emergency other than war. As is apparent governments could change the laws governing gold at any point, and often simply ignores the laws. The bill aims to pressure countries which the US labels as deliberately misaligning their currencies. It will require estimates of under-valuation to be included in “countervailing duty” tariffs Washington imposes on imports it deems to be state-subsidised. Although the legislation passed with a comfortable 63-35 majority, republican leaders of the House of Representatives have refused to schedule a vote on it. So… was the 9/11 event considered the ‘right time’ to confiscate other countries gold? Was it, among other things, orchestrated to veil this gold hoist? On Nov 01, 2001, the Times online reported about the discovery of hundreds of gold ingots, part of a 1 billion dollar cache which was lost when the twin towers fell. “The Comex metals trading division of the New York Mercantile Exchange kept 3,800 gold bars — weighing 12 tonnes and worth more than $100 million (£70 million) — in vaults in the building’s basement. Comex also held almost 800,000 ounces of gold there on behalf of others with a value of about $220 million. It also held more than 102 million ounces of silver, worth $430 million. website companion for the TV documentary America Rebuilds. The page, titled ‘A Treasure in Silver and Gold’, describes the vault; two levels of 3,000 square feet each. Image credited to Leslie E. Robertson and Associates. When the World Trade Centre was first bombed by terrorists 8 years before 9/11, gold worth more than $1 billion was kept in the twin towers basement vaults, it was the property of the Kuwaiti government. Since then the amount of gold kept under the World Trade Centre has been a carefully guarded secret. Mayor Rudolph Giuliani announced on 1st of Nov 2001 that “more than $230 million“ worth of gold and silver bars that had been stored in a bomb-proof vault had been recovered. But there seem to be no record available as to where the rest of it might be. Going back to where we started — James G. Rickards and James Turk, Director of the GoldMoney Foundation, talk about the European sovereign debt crisis and the European Central Bank buying Italian bonds in the video below. They talk about the ECB’s role in the crisis and how it is becoming increasingly politicised, in contrast with its predecessor of sorts — the Bundesbank. They talk about the possible differences between Jean-Claude Trichet and his successor Mario Draghi. James Rickards explains how Europe is developing a common fiscal policy with a common Treasury, in the form of the European Financial Stability Facility (EFSF), which will dictate fiscal policy to many member countries — such as Greece — in exchange for rescue funds. Rickards is bullish on the euro, among other reasons because the eurosystem owns 10,000 tonnes of gold. 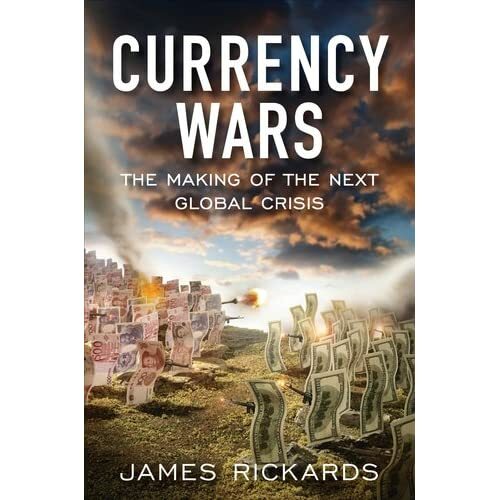 Rickards and Turk debate whether or not central banks really own the gold they claim to own, and talk about how the current currency war — with countries competing to see who can devalue their currencies the most — is a disastrous zero-sum game. They discuss the problems facing countries whose currencies are appreciating rapidly, such as Brazil and Switzerland, and what these countries might do to curb this appreciation. They discuss South Korea’s recent acquisition of 25 tonnes of gold, as well as Indian and Chinese buying. Rickards explains that China is trying to bypass the world market by buying directly from miners.